Georgia Institute of Technology, in collaboration (and sponsorship) from Intel developed a physics-based modeling platform that advances spintronics interconnect research for next-generation computing. 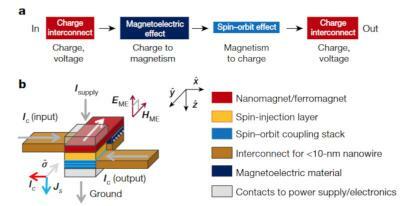 The researchers are focusing on developing spintronics switches with adequate connectivity. They are researching the communicating between spin-logic devices and they demonstrated that interconnects are an even more important challenge for beyond-CMOS switches. Intel is proposing a new neuromorphic chip design concept that uses multi-input lateral spin valves (LSV) and memristors. Using these two devices in a cross-bar switch lattice, one can build a neuromorphic CPU. The LSVs are the neurons and the memristors are the synapses. Theoretically such a chip could hold buillions of neurons and synapses and operate in the in the gigahertz or terahertz range. The device will also be quite efficient - about 300 times more efficient than CMOS equivalents.